Image | This entry was posted in Kathleen Friesen and tagged Kansas, Snow, Winter Storm. Bookmark the permalink. I think you should write a poem to go with this provocative photo. The title “Thunder Snow” says a lot about what it’s like to be alive in 2013. Thanks for this image. I’ll ponder your request. 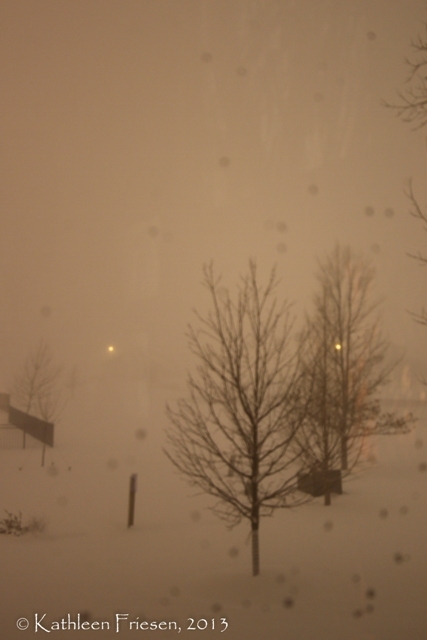 It was surreal to awake before dawn and find lightning and street lights reflecting off the snow shield. Thank you for the challenge and the comment!